Since the inception of City Tech’s OER Fellowship in 2015, and CUNY Central’s investment in OERs CUNY-wide, the number of Open Educational Resources that are public and freely available on the OpenLab have been growing. Each year the program has grown, with more new fellows each year than the last (3 in 2015, 7 in 2016, 14 in 2017, and 19 in 2018) and more OERs for a greater range of courses, from Culinary Tourism, to Biology, to Introduction to Mechanics. How can I find these resources and use them to support my own course work? Good news! The OpenLab now has created “OER Badges” that indicate when a course or project is an OER. Look for these OER Badges on course and project profiles! These badges are also searchable. 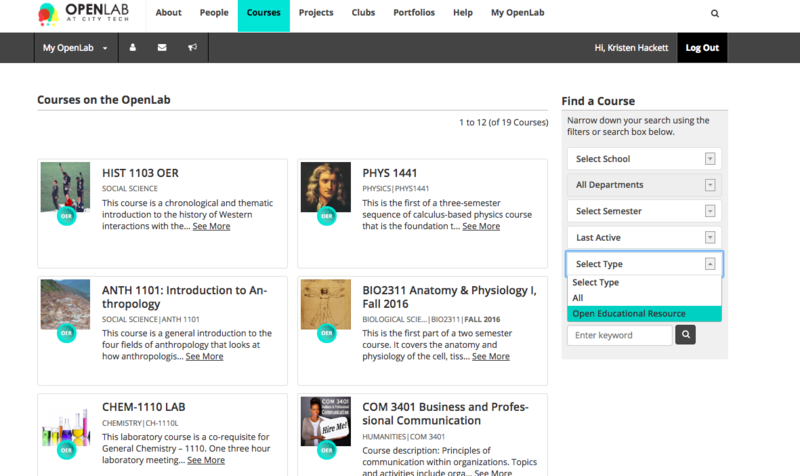 From the homepage, click on the magnifying glass in the upper right, and select EITHER courses or projects (OERs are built on either of these types of sites). If you don’t see what you’re looking for in one, try the other type. On the Search page, all of the filters may be set to your interests, except “Select Type”; for that field you’ll want to select “Open Educational Resources”. This will pull up any and all OERs that match the other filters you set. In some cases, you can clone an entire course, and remix, add to, or delete some of the content to meet your needs, and use it to support your courses. One thing to keep in mind when it comes to OERs, and open digital pedagogy in general – where educators are putting resources and course materials online in free and publicly accessible ways – is to give credit where credit is do. Acknowledge whose materials you are pulling from and how you used them. Did you clone the work of another professor and use their work directly? Did you “adapt their material or part of their material, or remix it with some of your own course materials? This information should be visible somewhere on your own site. You can also join us in-person for an office hour or workshop! Previous Previous post: Announcing Commons In A Box OpenLab!